My Ironman training is starting next week. My coach Barry filled out the plan for next week in Training Peaks. I noticed there wasn’t a rest day in the first seven days. hmmm. I think coach is trying to kill me early. I added Barry as my coach on TP and he has access to all the workouts and data online. I connected Training Peaks (TP) my GarminConnect account, so that the data from the actual workout uploads from my Garmin 920XT to the TP same event and the data can be compared. 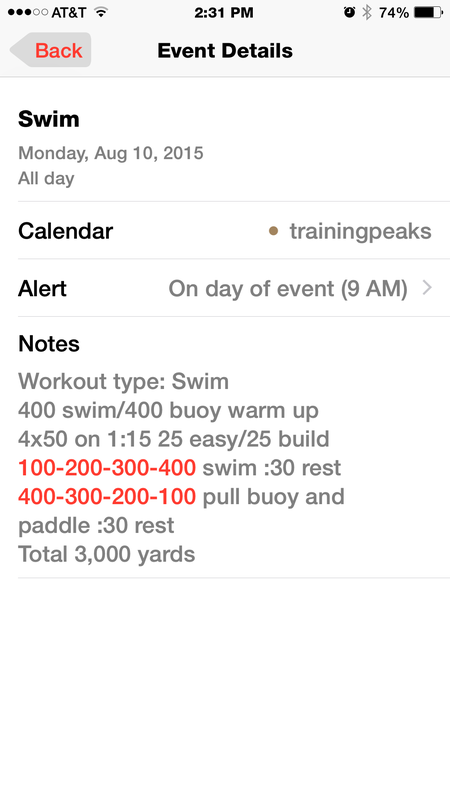 I subscribed / connected the TrainingPeaks calendar to my iPhone calendar, so that the workouts show up on my iPhone calendar and I know exactly what I’m suppose to do.